It sounds glamorous, living abroad in exotic countries, traveling regularly, meeting new friends, and exploring a new culture. However the reality can be vastly different. The life of an expatriate (expat) means packing up all your worldly belongings, moving to a house that you may or may not have seen, in a country that you may or may not have visited before. You leave behind everything you know and are familiar with, including family, friends, and a support network. While everyone at home continues with their “normal” life, you are starting a new life, in a whole new, often unfamiliar world. If you have children you need to find appropriate schooling, which isn’t always an easy task as International Schools quite often have long waiting lists. Then there is the arduous task of sourcing a new doctor, new dentist, hairdresser and finding the local supermarket. There are so many little luxuries in your day today life that you take for granted; yet when you become an expat, they can be huge challenges. As a general rule, many expatriates seem to underestimate the challenges of moving abroad. Often the spouse has left behind a career of their own to follow their partner. 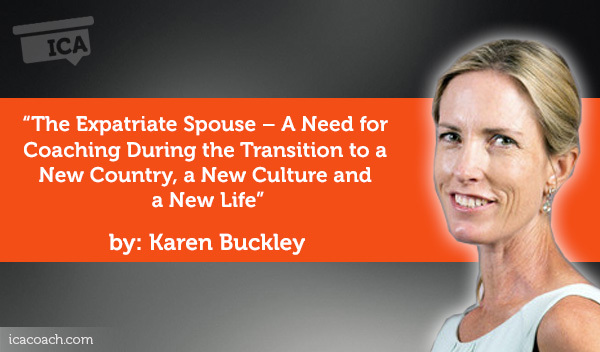 While their partner starts an exciting new job in a new office surrounded by like-minded people, the expat spouse can struggle to find their identity. The partner can be consumed with trying to settle in him or herself and make a positive impact in a foreign environment, which leaves little time to provide support for the spouse at home. It is quite common for partners to travel regularly with their job, which means the expat spouse is left alone to fend for him or herself. The research in this paper also bought to light the toll that the expat lifestyle can have on relationships and families as each person struggles to deal with the new experience in their own way. 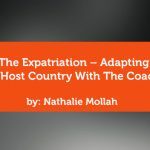 In this paper I will examine how to use a coaching model to help spouses of expatriates cope with the enormous challenge of facing life in a new country, and making that experience a richly rewarding one. We will explore how, with the right support, the expatriate experience opens your eyes to a whole new and exciting world. I have been a “trailing” spouse for the past 6 years and have moved countries three times, from Vietnam to Malaysia and then Hong Kong. I have had some wonderful adventures, and some very dark days when I just wanted to go home. In this paper i will draw on my own personal experience, internet research, interviews with expat spouses and reference books to underline the importance of support in an expatriate situation and how that support can make the difference between sinking and swimming. I will explore how a Life Coach can step in and create a safe space for the expatriate to share his/her concerns. 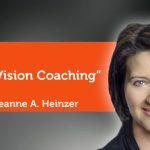 We will discover how partnering with a Life Coach can help share the burden of the uncertain months ahead, allowing the spouse to find a positive way to move forward to a fulfilling life in the new country. In its broadest sense, an expatriate is any person living in a different country from where he is a citizen. In common usage the term is often used in the context of professionals sent abroad by their companies, as opposed to locally hired staff. The differentiation found in common usage usually comes down to socio-economic factors; so skilled professionals working in another country are described as expats, whereas a manual laborer who has moved to another country to earn money might be classed as an “Immigrant”. The continuing shift in expatriates has often been difficult to measure. 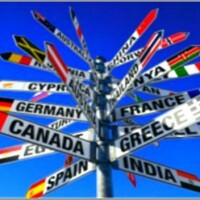 According to UN Statistics, more than 200 million people would be living outside their home countries in 2010. However, this number also includes immigrants. A roller coaster of emotions we feel when we enter and have to adjust to a culture/environment that’s not our own. These emotions can bring on symptoms that range from those experienced by our body (aches, pains, allergies) and those experienced by our minds (sadness, anger, loss of identity etc). In 2007 my husband, our three daughters and myself moved to Ho Chi Minh City, Vietnam. The girls 15, 14 and 11 had never left Australia before. We lived on six acres in a rural town complete with horse, dog and vegetable patch. We couldn’t have moved to a more culturally diverse location. The horror on their faces when we landed in HCMC, is now comical, but at the time, was almost enough to make me want to herd them back onto the safety of the plane and head for home. In the first few months the guilt of what we had done hung like a noose around my neck. The children were miserable, missing home, their friends and were too scared to venture far from our serviced apartment for fear of getting run over by the crazy motorbikes that seemed to be everywhere, even on the pavements! I spent the first week walking around the block as I couldn’t work up the courage to cross the road. I knew nothing about Culture Shock, and had very little support from my husband’s company about what to expect in our new city. As the Mother at home, I was the punching bag for all the pent up emotions my poor children struggled to deal with. Not only did they have to settle into a new school and make friends, they had to adjust to the British schooling system, which was markedly different from the Australian one, and much more academic. I was one of the lucky ones, while my husband had thrown himself into a challenging new role and was working long hours, he was also aware of the struggles I was facing, and was a great source of support for me. Many partners aren’t as empathetic and become absorbed in their new role, not realising the toll the new life is taking on the spouse at home. We lived in a very small serviced apartment for 3 months (which felt like forever), while I tried to find a house for us to live in, and supermarkets that had the sort of food we were used to…a challenge in itself! To have someone I could call on to support me during this difficult transition would undoubtedly have made a difference. If someone had explained that the guilt (loads of it), anger, frustration, and feelings of being completely overwhelmed were normal, I would have had some peace of mind. It also would have been great to talk to someone about how to deal with the children and make their life easier. 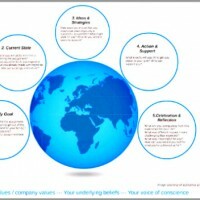 What are the biggest challenges you face when you move to a new country? After the first three months I was exhausted as every moment was spent finding a place to live, home schooling, settling the children in, dealing with a helper, finding friends, setting up a house, unpacking and the buying furniture we needed to live…I don’t think I had time to think about anything! The job of settling the family falls on the expat spouses shoulders, and he/she usually has to manage without a lot of support. The general feeling from my interview subjects was that becoming familiar with a new city, and being able to provide a standard of living that the family is used to, is tough. There is no doubt having someone to lean on at this time, would be a huge relief. Every time an expatriate returns home before completing his or her assignment, their employer loses on average $1 million. The number one reason for expats to make a premature return home is “spouse and family adjustment issues. Nina goes on to say that although employers are aware of this problem, they have been reluctant to establish spousal assistance programs. As a result of her interviews, Nina Cole found the most frequent recommendation related to the need for practical support immediately upon arrival and over the first few weeks of settling-in. Spouses overwhelmingly found this experience to be very difficult and many expressed a strong belief that the best source of support and assistance would be another expatriate spouse who had already settled into the location. Most wanted access to a “go-to” person for all their questions and quandaries based on their individual family circumstances. Practical support from another expatriate spouse during the settling in period. 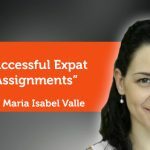 As I did more research into this topic, it became clear that the employers were taking responsibility for the physical move, but the needs of the expat spouses were being overlooked. When one of my friends moved to Hong Kong, the company had available a welcome pack and contact details of other expat spouses especially for new arrivals. However, it took a school parent to chase this and let her know it was available, not the company. A fact: A large percentage of expatriate assignments fail because of family adjustment issues. A fact: Expatriate spouses play an important role in family adjustment. A sad fact: Very few companies are doing anything to help expat spouses adjust and overcome challenges of an expatriate lifestyle.